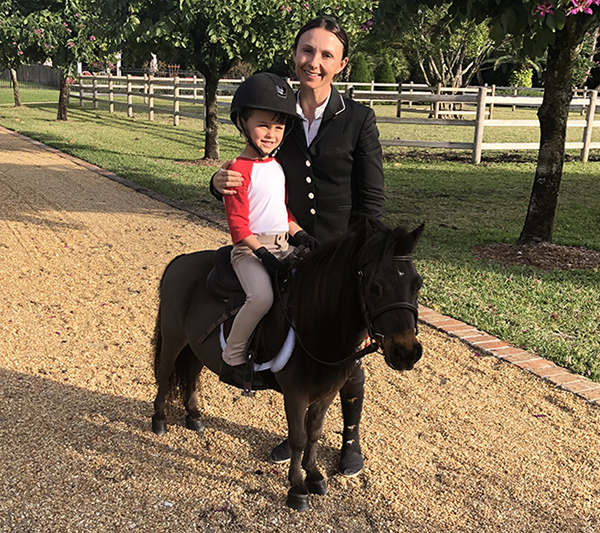 When Georgina Bloomberg, EQUUS Foundation EQUUStar, renowned International rider, and animal welfare advocate, wanted to peak her five-year old son’s interest in learning to ride, Bloomberg reached out to the EQUUS Foundation. Angeli reached out to Kelly Smith at EQUUS Foundation Guardian Omega Horse Rescue. EQUUS Foundation Guardians are charities on the EQUUS Foundation Equine Welfare Network that demonstrate a commitment to public transparency by their willingness to publish and share extensive data about their programs, horse care practices, and governance. Only Guardian charities that operate at the highest standards for horse care are eligible to receive financial support from the EQUUS Foundation. Angeli inquired about Teddy, a miniature horse rescued by Smith from a kill buyer’s facility. Teddy was a sweet and docile horse who had been trained to be ridden and driven. “It’s a fate that so many wonderful horses tragically face and it just shouldn’t happen. It was clear, after speaking with Georgina and Kelly extensively about this match, and then the trainer for Omega who described Teddy’s gentle way and skills, that this would be a wonderful new chapter for both Teddy and Jasper,” said Angeli. 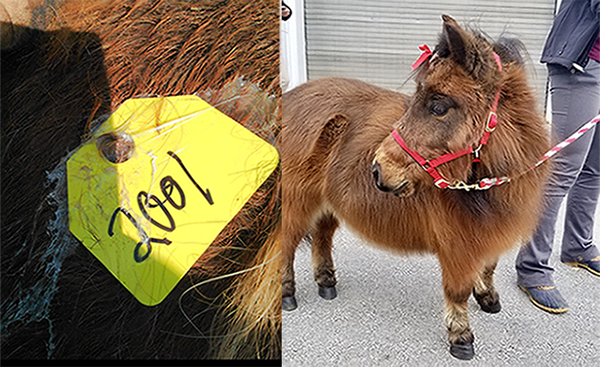 So just like that, little Teddy was adopted and shipped from Omega’s home base in Pennsylvania in mid January, looking like a little wooly mammoth in his fuzzy, winter coat. 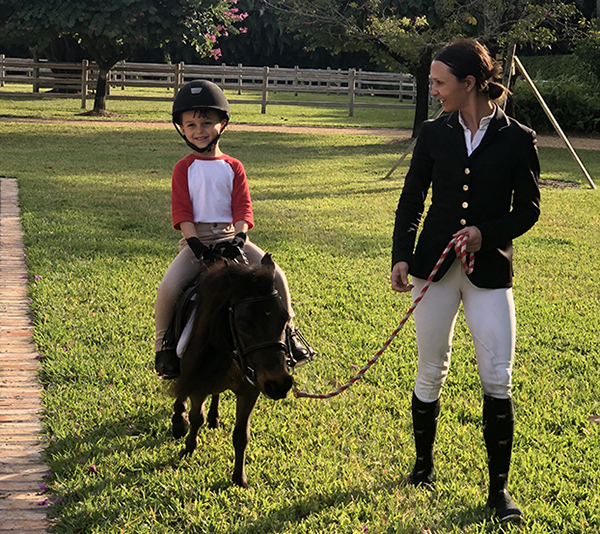 Teddy was met with excitement at Gotham South in Wellington, Florida, which is Bloomberg’s home base for her show jumping operation in winter. Teddy instantly got a hair trim and a makeover and transformed into a heart breaker not to be believed! Jasper instantly fell in love with Teddy at first sight and was ecstatic to have his first ever riding lesson on the little gelding. Learn more about Omega Horse Rescue here. Donate to Omega Horse Rescue here. Only EQUUS Foundation Guardians have a DONATE link and receive 100% of all donations made on their behalf. A Happy Ending for Teddy and just the beginning of a life together for both him and Jasper! About EQUUS Foundation: The EQUUS Foundation, a 501(c)(3) public charity established in 2002, also known as Horse Charities of America, the only national animal welfare charity in the United States 100% dedicated to protecting America’s horses and strengthening the bond between people and horses. Donations are tax-deductible to the full extent of the law. Contact the EQUUS Foundation, Inc., at 168 Long Lots Road, Westport, CT 06880, Tele: (203) 259-1550, E-Mail: mail@equusfoundation.org, Website: www.equusfoundation.org.